I've been training young keepers recently, and I've been reminded of something I've long noticed about them: they like to guess where shots are going. As the title says, anticipation is a skill, and there absolutely IS a time to take your best educated guess about where the attacker is going to shoot. But when you're a young keeper still learning the basics of moving into a good set position, and then reacting to the shot you see, that time is not in shot-stopping drills. 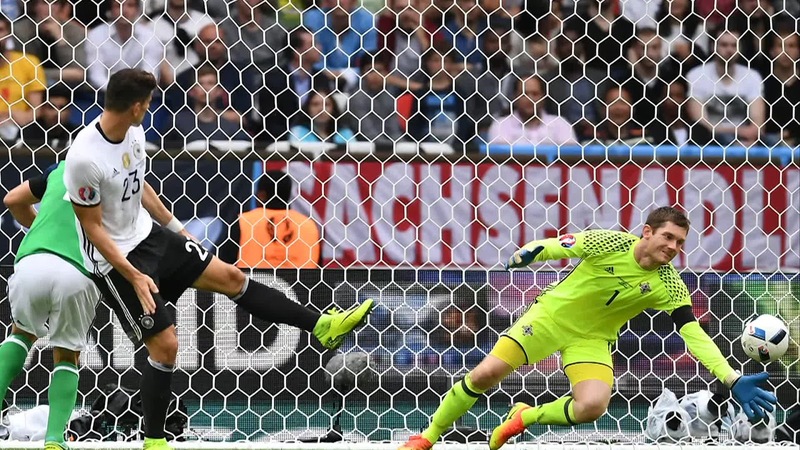 Advanced, experienced goalkeepers use anticipation - one aspect of 'reading the game' - in a number of situations, from collecting through balls, adjusting their starting position for a cross, or, most obviously, for penalties. But what we're concerned with here is shot stopping. Why would you ever guess or anticipate where an attacker is shooting? Generally, the only time you want to do this is in a situation where you are very unlikely to make a save unless you get a head start on the attacker by correctly anticipating the shot. This usually means shots from close range, where the attacker has time and space to pick a corner, and you don't have time to close them down. This often happens at set pieces, when the ball isn't properly cleared, and drops to an attacker right in front of goal. 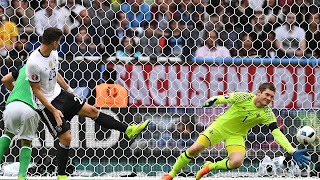 You certainly can get set and try to react as he finishes from six yards, but the odds are stacked heavily against you, and the better goalkeeper will not only anticipate where the shot is going, but actually influence the striker to shoot where you want him to shoot. More on that later, but for one example, here's David De Gea showing Eden Hazard the near post, then taking it away. It drives me a bit crazy when keepers don't back themselves to make saves, and start guessing/leaning for shots from close to the top of the box, when they've got a better than fair chance to make a save. I don't think this is the time to be guessing, and to me, it's a sign of anxiety and insecurity. 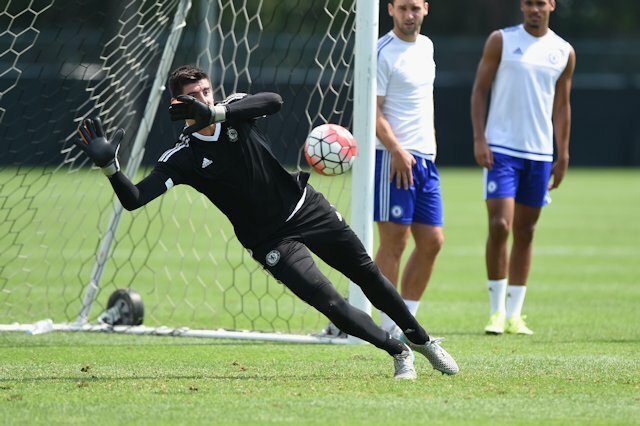 Confident keepers get into a good set position, and react to the shot they see. Sure, some of these shots go in. We wouldn't have much of a sport if there were never goals. But it's important to understand when it's appropriate to anticipate (odds stacked against you), and when you should trust yourself to see the shot and react to it (odds more even). Young keepers guess in training because they haven't yet understood the point of training is to improve their overall skill set, and instead they're just trying to save each individual shot they see by whatever means they can. It's not a bad instinct, but it robs them of the opportunity to improve the very simple but critically important skill of moving into a good set position, then reacting appropriately to the shot they see. Assuming a good set position, reacting to a shot requires good balance and footwork, coupled with appropriate technique. It has to happen fast; you've got less than a second to react to a moderately struck shot from fifteen yards. Like any other skill, the more often you do this, the better you get at it. So when I'm running a shooting activity with young keepers, I work hard to encourage them not to guess or lean so much, and trust that even if they get beat, they're on the road to improvement if they manage to react to the shot. Guess correctly and make a save in a shooting drill? Great, but you're not chasing results in training, you're following a process. But if there's a time for anticipation, doesn't that mean it should be trained, too? Sure, and you can construct drills to do it, but I think it's best honed in game situations during team training, rather than goalkeeper-specific training. It's difficult to replicate such situations realistically, unless you have defenders and attackers joining in with goalkeeper training. The key, again, is making sure the young goalkeeper understands when to stand and react, and when it might be best to anticipate. I mentioned how the skilled goalkeeper can sometimes flip the odds by influencing the attacker to shoot to a specific spot. The phrase I have for this is, "Show it to them, then take it away." You might close down an attacker being intentionally slightly off your ball line, exposing one side of goal, and then dive/lunge that way just as the attacker shoots, as De Gea does in the video. That's a very simplistic description, and there are lots of subtleties involved (ironically, it's less effective against lower-level players who never get their head up to look at the keeper). But the idea is to give the striker something to shoot at, then get a head start on the shot, moving before the ball is struck. The risk is that you might be wrong, but this is why it's best used only in circumstances where the odds are already against you. In all others, the surest way to solve problems is to move smoothly into a good set position, then react to the shot you see. The more you do this in training, the better and quicker you'll execute it in games. Hi, I was wondering about how this idea could be applied in saving penalties. Given that often nowadays we see penalty-takers taking advantage of keepers' tendency to guess where the ball is going, by either shooting down the middle or waiting for the keeper to dive, is it possible that more success can be obtained by encouraging keepers to try to see the shot and react, rather than guess? Goalkeeper is a very important position. The goalie needs to get good judgment skills.